The Bulls had a day off yesterday, so no game to talk about. Lacking that, time to pick up a few odds and ends. 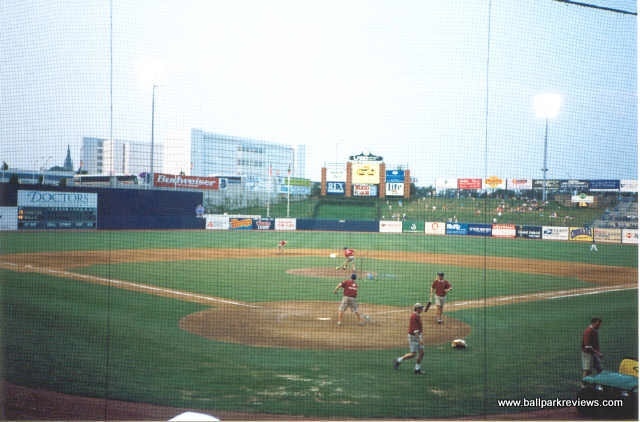 Let's start with a view of the DBAP in 1997. Check out that skyline. Just the jail pokes up and there's no Blue Monster, no Diamond View buildings, no DPAC, no north parking garage. Felipe Lopez passed through waivers and will be coming back. No word on who might come off the current roster (if anyone) to make room. For Bulls fans who think that the Hudson Valley Renegades are a myth and exist only as a place to hide Durham Bulls over-roster players, here's their roster and their website. Why was the weather so beautiful last Tuesday night? Because head groundskeeper Scott Strickland invoked the gods of baseball and suffered through a deeply personal loss so that we would be dry. Thanks, Scott! To follow up on promotional gimmicks, the Charlotte Stone Crabs may have crossed some kind of invisible line. At any rate, if you've got a really hairy back, and you want to get rid of the hair, here's your chance. For the sabermetricians among you, here's a DRaysBay writer's look at how the team is doing. He missed some of the roster changes, but this is a terrific bit of analysis. Some are thinking that Scott Kazmir, last seen in Durham in June 2009 pitching a rehab start, is about to be released from the Angels. Justin Ruggiano gets a look from the St. Pete Times. Dirk Hayhurst hints that all may not be well with some players in some locker rooms. "In the big leagues right now, there are pot smokers who mix pain and sleeping pills with alcohol, and no one says a word." Down in Gwinnett, they've also got rehabbers going back and forth. Even if it's only a taxi ride from Lawrenceville to Atlanta, it's got to be a hassle schlepping your gear around. Had not seen that before. Makes me wish I was down there with some melted butter and good beer at a nice South Florida restaurant.